We are very proud to work with the following companies who share our passion for excellence. 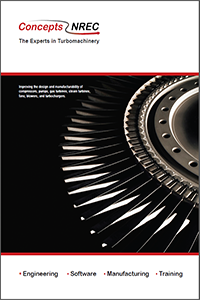 The process of designing and manufacturing turbomachinery is extremely complex. Concepts NREC partners with other world-class software providers whose offerings complement our Agile Engineering Design System®. Click on their names to explore all they have to offer. MAX-PAC CAM tools have long been recognized as the preeminent software for 5-axis milling of turbomachinery impellers, blisks, and rotors. We have strong partnerships with leading 5-axis machine-tool companies, including. As stated on the US government's website: the Small Business Innovation Research (SBIR) program is a highly competitive program that encourages domestic small businesses to engage in Federal Research/Research and Development (R/R&D). The SBIR Programs mission is to support scientific excellence and technological innovation through the investment of Federal research funds in critical American priorities to build a strong national economy. We have a global network of sales channel partners who service customers located in specific regions. Champion Machine Tools (HK) Co., Ltd.